A bay window created when three or more panes of glass are set at angles and separated only by the window frames. A bay window effect achieved by arranging windows at an angle with sheetrock/trim work between the window panes. A beautiful bay window can be achieved with many options including shades, blinds, top treatments, curtains and more. For a neat and clean look, simply use roman or roll-up shades on each window. Drapery panels placed in each corner will accentuate the shape and pull the focus inside the bay window. To unify all the windows and define them as one, install drapery panels on the two sides. 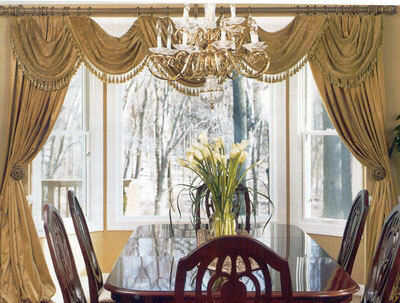 A continuous valance will visually connect all the windows, while a swag above each window with an embellishment like a rosette, jabot or tassel between them can create a dramatic effect. Click here for more custom window treatment options. InteriorDecorating.com has all the hardware to create any look for your bay window. The bay curtain rods are perfect for stationary applications like valances and sheers. If treatments need to open and close, traversing options are available as well. Our flexible curtain track can be used to achieve a curved look (cover with a standard bay rod and valance for a more decorative look). We can also custom make a traverse rod. Wood and wrought iron applications can be created using c-rings and swivel brackets.